Graduation rates in the Long Beach Unified School District increased for the third year in a row, again surpassing state and county rates. Students of color in Long Beach schools also outperform their peers countywide and statewide, according to 2015 data released by the California Department of Education. 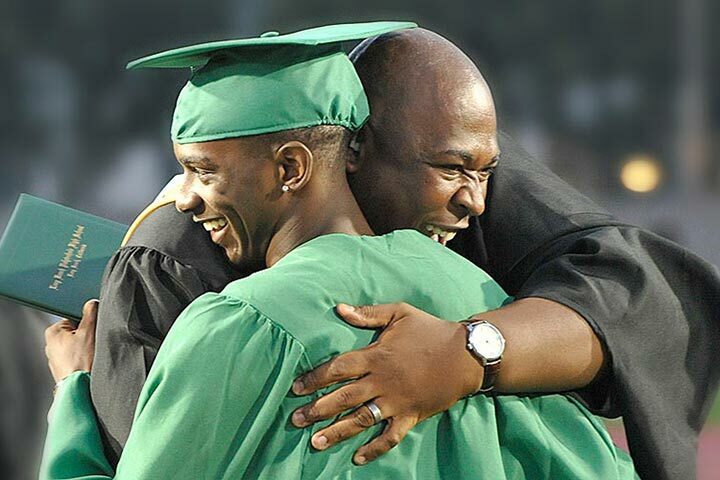 Six of the school district’s high schools now report graduation rates above 90 percent. Six high schools here posted graduation rates above 90 percent, including the California Academy of Mathematics and Science, along with Avalon, Lakewood, Millikan, Renaissance and Wilson high schools. Cabrillo, Jordan and Poly high schools all reported graduation rates exceeding the state average of 80.8 percent. LBUSD’s overall graduation rate is 81 percent, up 0.2 percentage points over last year and surpassing both Los Angeles County’s rate of 78 percent and California’s rate of 80.8 percent. Long Beach students outperformed their peers statewide despite greater poverty challenges here. About 68 percent of students here qualify for subsidized meals at school, compared to about 59 percent statewide, according to 2013-14 data. The school district’s African American and Latino students outperformed their peers at the county and state levels. The African American graduation rate in LBUSD is 73.7 percent, surpassing California’s rate of 68.1 percent and Los Angeles County’s rate of 67.9 percent for the same racial/ethnic subgroup. LBUSD’s Latino students graduated at a rate of 78.8 percent compared to the state’s 76.4 percent and the county’s 74.8 percent for the same population. Latinos, African Americans and whites represent the three largest groups of graduates in LBUSD. At several LBUSD high schools, students of color now outperform their white counterparts in terms of graduation rates. Latinos, who are by far the largest ethnic subgroup in the school district, outperformed their white counterparts at Cabrillo, Lakewood, Millikan and Renaissance high schools. African American students surpassed their white counterparts at Cabrillo and Renaissance. To view and download state, county, district and school graduation and dropout rates, visit the California Department of Education's DataQuest website. Caution is urged when comparing graduation or dropout rates across some individual schools and districts. For example, some county office schools, alternative schools or dropout recovery high schools serve only those students who are already at the greatest risk of dropping out, compared with the broader population at traditional high schools. Therefore, these individual schools and districts cannot be directly compared, according to the CDE. Graduation and dropout rates for counties, districts and schools across California were calculated based on four-year cohort information using the state's California Longitudinal Pupil Achievement Data System (CALPADS). This is the fifth time this four-year cohort information was calculated, meaning data may only be compared accurately over the five-year period from 2009-10 to 2013-14. Prior to 2009-10, graduation and dropout rates used different calculation systems and cannot be accurately compared to the cohort rates. GRAD RATES UP – Graduation rates in Long Beach schools exceed state averages. Pictured is Poly High School's 2015 graduation ceremony.